Here is the impressive panel of contributors for our Live Blog today at LeadGood Live! Amazingly impressive. Like I can’t believe they wanted to do this. Like I hope they will speak to me tomorrow. I greet the college basketball championships this year with mixed emotions. As a hoop fan, this is a highlight of the calendar. As an ethics and compliance professional considering the current pay-for-recruitment scandal at several leading schools, well, what a mess. 6, starting at 2 PM (Eastern) and going until 6:00 (at least). Join me, Tom Fox, Matt Kelly, and other guests as we discuss current issues in compliance and ethics, including compliance in sports and education, and sports as a metaphor and lesson for corporate C&E efforts, as well as the cultural messages about ethics and compliance that a typical NCAA viewer is receiving – in the ads, during the games, and real-time in social media. We might talk about other E&C topics. And judging from last time, we’ll talk a little hoop, too! 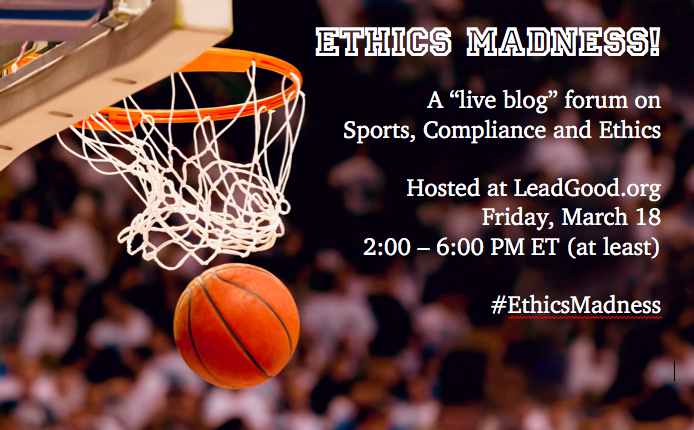 And throughout the tournament, let’s all resolve to share our E&C thoughts by using the hashtag #EthicsMadness. I am honored and excited to have once again been asked to present a double-shot of panels at the annual Compliance and Ethics Institute of the Society of Corporate Compliance and Ethics, coming up in Las Vegas in October 2018. On Sunday, October 21, I will co-lead a three-hour workshop on “Preventing harassment: can compliance ever succeed?” Joining me will be my frequent speaking partner and project colleague Amy McDougal of CLEAResources, LLC, and Susan A. Parkes, General Counsel & Vice President of Alyeska Pipeline Service Company. It’s been 20 years since the Supreme Court rulings in Faragher and Ellerth made corporate anti-harassment efforts routine, yet there are more headlines than ever about blatant acts of harassment, especially among corporate and cultural leaders. Sharing research and our collective experience, this workshop will focus on training, policies and culture-building, to explore why we have failed in preventing harassment, where we have engaged, and how we can elevate behavior. One critical focus will be retaliation vs. a “speak-up” culture, including best practices for creating, maintaining, and getting management support for an Open Work Environment. Businesses with under 100 employees make up 97% of US companies, and headlines show they are at least as prone to compliance-related failures as the Fortune 2000. But “SMBs” are unlikely to have a CCO or even GC. So the task of leading and counseling compliance falls to other professionals, including HR and outside counsel. In this panel, Amy and I will explore the unique challenges of compliance leadership in SMBs, where budgets may be limited, processes informal, and executive power dominant. We’ll share experiences, including ways to use regular operational processes as tools to promote compliance, and to use the strong culture in these companies to their ethical advantage. From #MeToo to campus speech to AI to perceived conflicts of interest, concerns about ethics are now even more a part of daily life at companies, colleges and universities alike. For both sides, this concern is only more heightened when it comes to their partnerships with other institutions. (Who are your partners, and what do they appear to stand for?) In this panel, ethics and compliance professionals from academia and industry will share their respective points of view and current concerns. The goal will be for attendees to understand better not just what their partner needs their institution to do, but how it hopes they will do it. If you are at any of these events, say hi! Love Compliance? Love #MarchMadness? Then here’s a fun way to combine the two! Compliance in Sports – there’s a lot to talk about, from FIFA to tennis, Penn State to UNC, concussions to doping, the brackets etc. Sports as a lesson and metaphor for corporate C&E efforts – the influence of money, cultural framing, teamwork, coaching, etc. And yes, we might talk a little Hoop, too! You can follow our discussion — and add your own comments! We’ll start at 2:00 PM and keep it going until at least 6 PM Eastern, and very likely until the afternoon games wrap up a little later. Had a fun little idea I want to spread. If you are watching the “Big Game” Sunday Feb. 7 (or the “Big Pre-Game” or the “Big Post-Game”), and a pithy thought pops into your head about ethics, or compliance, or business leadership and culture, please join me in using the hashtag #SB50Ethics. And if you just want to see what E&C oriented folk are thinking, then follow #SB50Ethics. No pressure. It’s not a live-blog, something happening every 30 seconds, must write thing. Just thought I’d suggest a single social media home for our collective musings, however casually they are offered. Will we really be thinking about ethics between the wings, beer, and commercials, you ask? Oh, yeah. Hear about this year’s Budweiser ad theme, “Give a Damn“? Ever seen a Go-Daddy ad? Or maybe you will just HAVE to tell the Twittersphere that you CANNOT believe DENVER is using a THREE-MAN front and STILL doesn’t leave a D-Back to spy on Newton. In any case, I hope you will join me and some friends, and have a moment of fun at a little E&C virtual Super Bowl party. 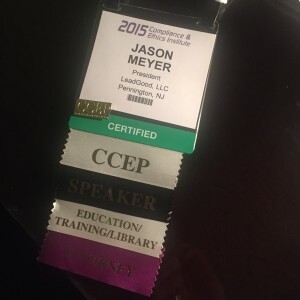 My Proposals for the 2016 #SCCEcei – What’s Your Fave? I’m really excited about the three panel proposals I submitted last night to the Society of Corporate Compliance and Ethics (SCCE), for its 2016 Compliance and Ethics Institute. Thanks to Amy Hutchens, JD, CCEP, Page Motes and Heather Powell for joining in. An advance workshop on drafting and negotiating contracts with compliance provisions — this would take the next step from the compliance contract panels that Amy and I did at the CEI in 2014 and this year. “The Good Reasons Why People Do the Wrong Things” — Exploring the frequent instances when people follow their own ethical code and choose to break rules. (Think about teachers or nurses following their deep ethic of care.) The lesson: it’s not just greed or “bad guys” that lead to misconduct. “Fostering a Speak-Up Culture: What Really Works” — Now more than ever, it’s critical for compliance professionals and business leaders to focus on what, objectively, has worked best to foster and maintain a culture in which people report suspected wrongdoing freely, constructively, and internally. So how do you make that happen? I wish they’d let us do all three of them! So tell me, what’s your favorite? 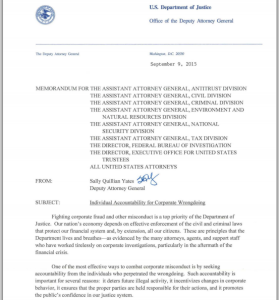 I wrote last month about concerns that the Justice Department may have gotten off to the wrong foot, tone-wise, following its “Yates Memo” declaration that it intended to prosecute individuals within companies for their organization’s wrongdoing. But, as Mike Volkov so well summarizes, the top enforcer on this playing field quickly found a case with which to make its point. On October 29th, the DOJ announced a $125 Million criminal settlement with pharmaceutical company Warner Chilcott (once Galen, now Actavis). In the same breath, Justice also announced criminal charges against four company employees — including the company’s former president. According to the release, several other employees have already pled guilty or been indicted on criminal charges. The cases arise from Warner Chilcott’s payment of kickbacks to physicians to induce them to prescribe its drugs. Interesting, and not surprising, that Justice struck this blow in the healthcare industry. Pharma and Medical Technology have been the industries on the bleeding edge of enforcement (and internal compliance efforts) since the 90’s (at least). In commenting on my earlier post about the tone being struck by the DOJ, Scott Killingsworth pointed out that “the DOJ will tell you what they are going to do, and then by golly they will do it.” I agreed, and I speculated that the Department must be “itching” to prosecute some company executives. Not that it took much in the way of powers of prediction, but it looks like we were right. Executives and companies who ignore the Yates Memo do so at their peril. 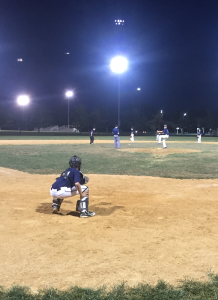 In honor of the end of baseball season, I am recalling (and revising) some thoughts I originally posted last fall— and adding some pictures. Hope this takes you out to the ball game. Does that make me Mister Baseball Buzzkill? Yeah, maybe so. But I think there is a parallel between the Compliance Officer and the Groundskeeper. I mean, compliance is in large part about winning while staying inside the lines. And for an organization, who paints those lines? Government? Regulators? An industry Code? Your Code of Conduct? Sure, but not precisely.The Rules of the Game may specify that the foul line extends from the first base line and the third base line. 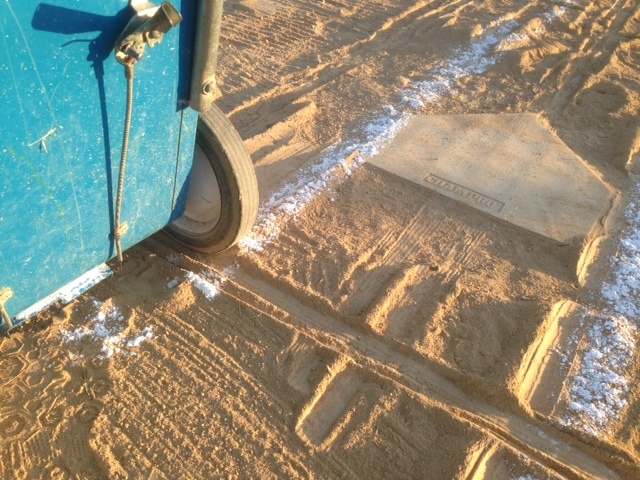 But it is still the compliance team that has to paint the lines precisely. To push my metaphor way too far, compliance leadership has to decide the slope of the base path, and the tendency of slow grounders to stay in bounds or to roll foul. And to abandon the realism of my metaphor, we have to decide whether to paint the lines on our own field with a little cushion, so minor fouls don’t really cross the legal line… or paint the lines wide, to give our organizations a bigger playing field but also a bigger risk of stumbling out of bounds. But most of all, as compliance leaders we have to do the painting. 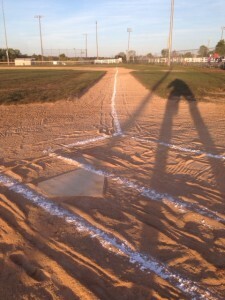 The Rules may say where the foul line should be, but the players would be left to just guess what’s foul and what’s not if we didn’t draw an actual line that they can see while they are playing. Our teammates rely on our education programs, our communications, and our internal enforcement to know where the dividing line falls. The author’s first-base line was visibly imperfect, but did not ultimately affect the course of play. Frankly, I can think of times when my base lines left something to be desired, straightness-wise. The umpire might have checked to see how I drew the line (or he might not have), but once play began, he relied on the white line I put down in chalk. It’s a big responsibility. So you can picture me standing out there today, superimposing all these philosophical musings about work onto our national pastime. Then you can picture my son pointedly reminding me that the game is about to begin, and that I need to get my carcass off the field, and help coach my players to success. As important as it usually is that “Compliance” be independent from “Legal,” there are realms in which it’s best when those two functions are full collaborative partners. One of those is the realm of contracts with third parties. our Contract Clauses Running Offense and Defense For Your Ethics and Compliance Program?” I had the honor of presenting the session, with Amy Hutchens of CLEARresources. I also had a complete blast, pretending to negotiate typical clauses with Amy, fielding questions about covenants that troubled SCCE colleagues in the audience, and sharing our lessons-learned. That the intersection (collision?) of transactional law and corporate compliance is happening more often, as companies pay more attention to the risks their third-party relationships can pose, and authorities from the Sentencing Commission to the FDA voice their expectation that these risks be managed contractually. That a careless clause can damage the structure or credibility of a company’s compliance regime – but a legal department engaging in zero-sum negotiations, without benefit of a partner from compliance, might miss that risk. That there are two strategic extremes for the company in the “prime contractor” role, each of which can be problematic: Unyieldingly insist on the most favorable language for your side, and eager vendors may agree even though they know they cannot follow the contract they signed. Take an overly flexible position, open to each vendor’s full range of concerns, and your resources may get nibbled to death while you wind up with no predictable consistency among your agreements. What’s an enlightened company to do? First, consider your goal – is it to get a signed document full of hard-ball victories, or to have third-parties who are actually working with your guidance to engage in compliant behavior? Assuming it is the latter, your company may be better served by living its core values even in its negotiating style, and by taking a firm, comprehensive, but reasonable form of contract to market. And for that to happen, “Legal” and “Compliance” must work together, and understand the other’s issues. 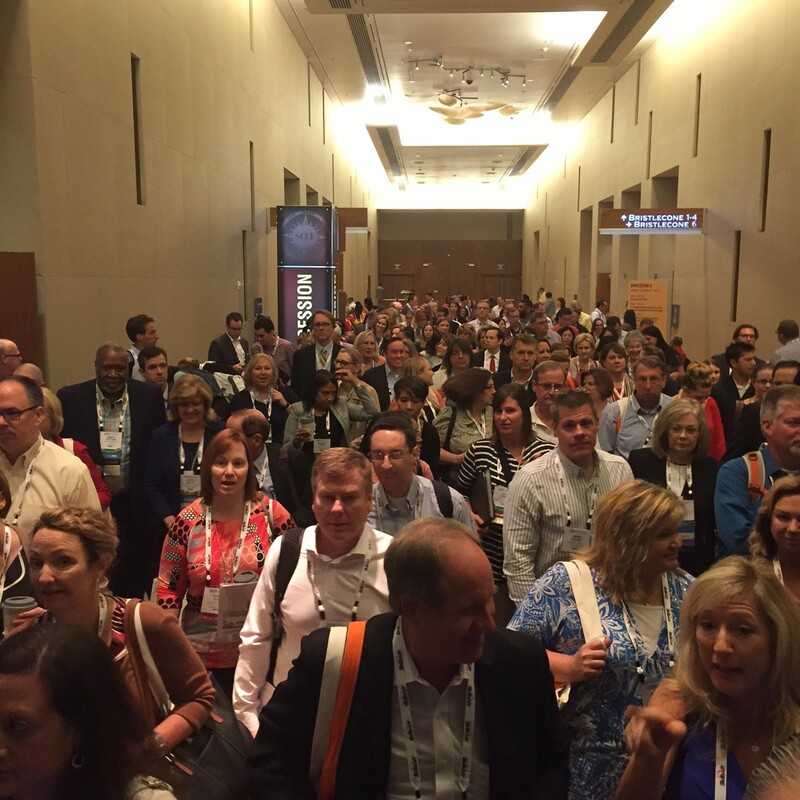 If you missed the session at the CEI – or if you missed the CEI altogether – no worries. We are reprising the session in the form of an SCCE Webinar, on Tuesday, October 13th. Please join us!